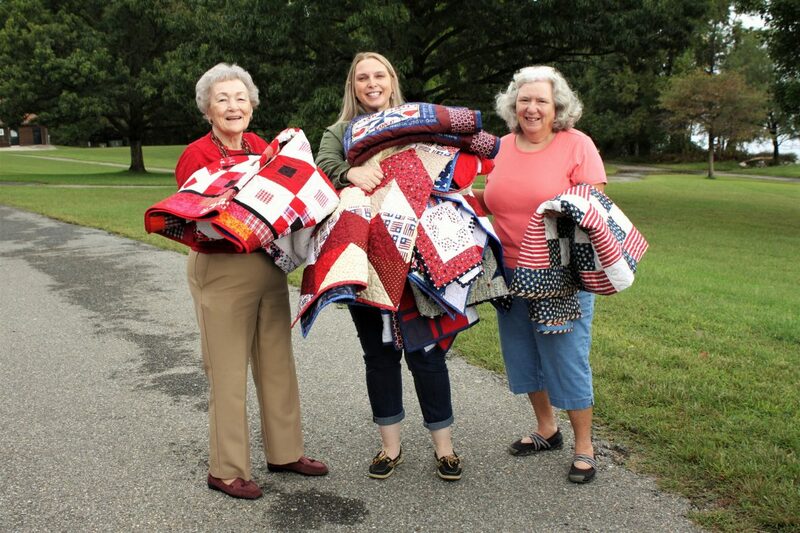 Downs Park Quilters co-presidents Millie Gentile, left, and Shirley Wise, right, pile some of more than two dozen quilts created by members of their group onto the arms of Hospice of the Chesapeake Veterans Volunteer Service Coordinator Nicole Malatesta. The quilts will be given to veteran patients of Hospice of the Chesapeake. Four years ago, Millie Gentile learned from a good friend about Hospice of the Chesapeake’s Honor Salute program wherein dying veterans were thanked for their service with a brief but formal acknowledgement from military volunteers. Part of that moving moment included the gift of handmade patriotic lap blankets. 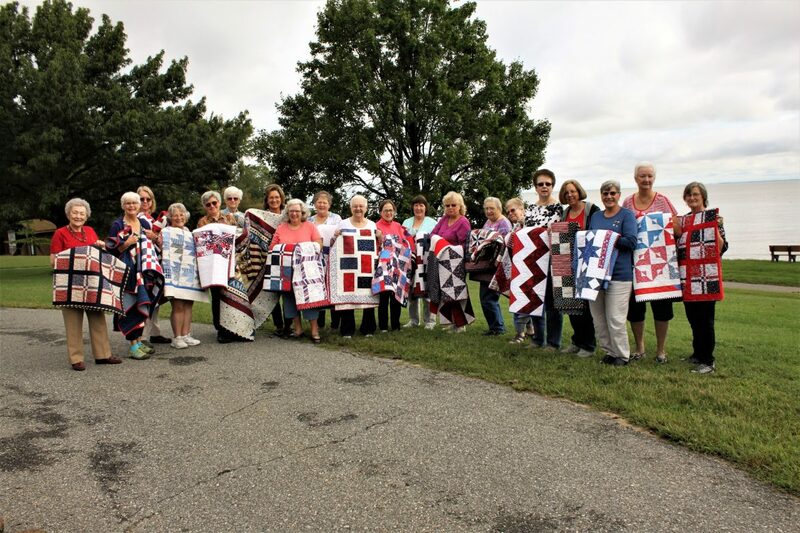 The skilled quilter donated a red, white and blue quilt she stitched and was so moved by the idea, she told her friends. Luckily for the Pasadena nonprofit, those friends happened to be the Downs Park Quilters. 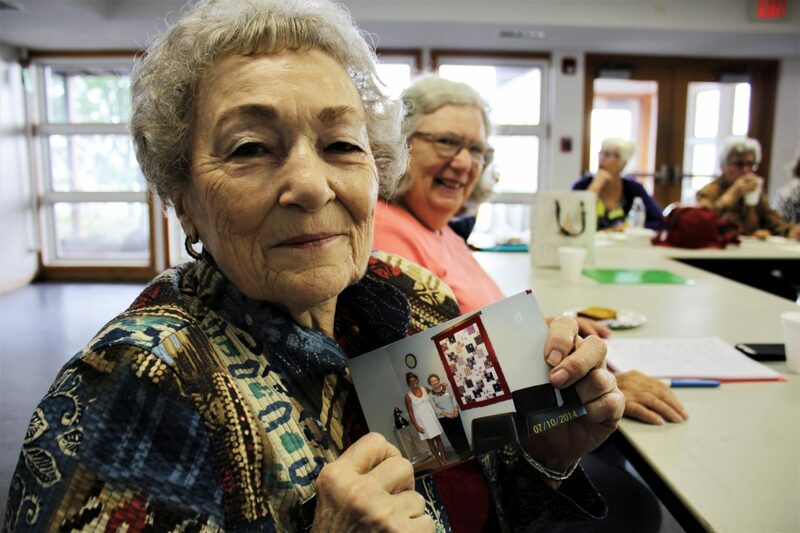 They all agreed with co-president Gentile that creating and donating quilts for this project fit in well with the club’s mission of turning their love of quilting into love for the community. When the quilters realized they would be approaching a milestone of more than 100 quilts donated to veteran patients, co-presidents Gentile and Shirley Wise invited Nicole Malatesta, Hospice of the Chesapeake’s Volunteer Services Coordinator for its We Honor Veterans Program, to its Sept. 28 meeting to accept what turned out to be the motherlode of patriotic quilts. Malatesta shared with the membership how important their donations are to the veterans who receive them, sharing stories of how moved patients and families are by not only the generosity, but by the craftsmanship of the quilts. “One veteran quickly handed over his old lap blanket to his family and said, ‘get rid of this ratty old thing – this is the blanket I will be using from now on!’” Malatesta said. She also told the quilters that at least one patient requested that they be buried with the quilt. The quilting group meets Friday mornings in the park to share their love of quilting. Besides stitching blankets for Veterans, the group also sews quilts for premature babies at local hospitals and pillows for breast cancer survivors. Over the years, the quilters have raised more than $25,000 for the park they call home by raffling elaborate quilts which take the group six to nine months to piece together. To join the group or to learn more, call Wise at 410-255-0618. To donate quilts to or learn more about the We Honor Veterans Program, contact Hospice of the Chesapeake at nmalatesta@hospicechesapeake.org or call Malatesta at 443-837-1513. Learn how grief can change one’s identity and earn CEUs with ‘Who am I now?